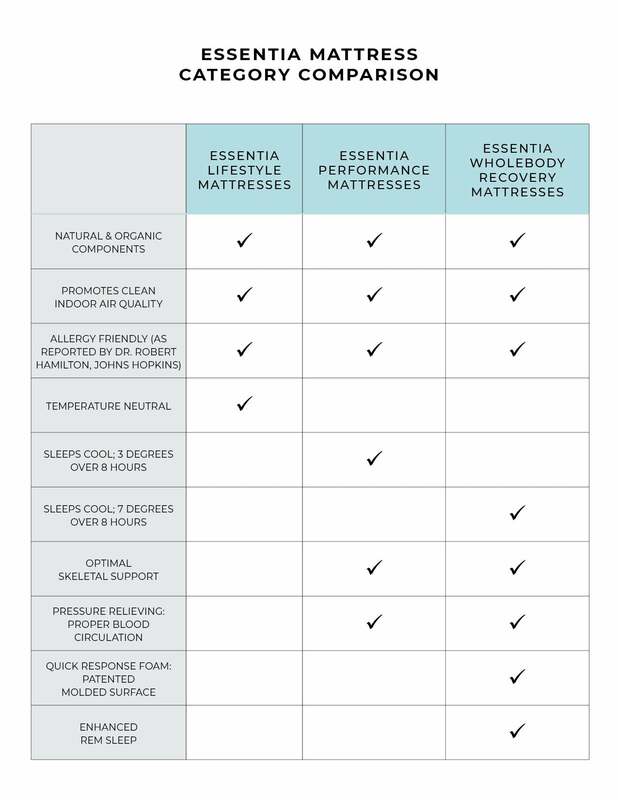 Firm Memory Foam Mattress - Beausommet | Essentia | Organic Essentia Mattress Inc. The mid-contour of the Wholebody Recovery category, the Beausommet formula offers elasticity for a firmer feel that doesn’t compromise spinal health. These mattresses are all about promoting repair and recovery of body and mind. Featuring Essentia’s patented molded technology the Wholebody Recovery collection of mattresses are the only to offer all six key elements needed for true full body recovery of mind and body. A firm mattress isn’t healthy for the body and spine as it creates pressure points, the elasticity of the Beausommet formula offers the illusion of a firm mattress with a mid-contour for the ultimate in posture support and pressure relief. Made in Essentia’s GOLS and GOTS certified organic factory using only the highest quality natural and organic ingredients the Beausommet reduces VOC exposure and promotes a clean air environment. Found only in Essentia’s molded technology, the fast response natural memory foam on the Beausommet reacts quickly to your natural movements at night, reducing sleep interruptions. While the pressure relieving surface eliminates numbness and soreness ensuring you remain in REM and deep sleep cycles which equates to whole body recovery. Offering unmatched deep sleep cycles, Wholebody Recovery mattresses promotes micro-hibernation as the surface drops on average seven degrees cooler than your internal body temperature over an eight hour time lapse. Ensuring pressure relief and contour, the Beausommet delivers true whole body recovery. 5 inch natural support foam gradually transitions to your body offering proper spinal alignment for support that doesn’t bottom out. 2 inch high density molded natural memory foam layer offers a quick response exclusive to Wholebody Recovery mattresses.